Facebook advertising is a self-service online ads tool. As long as you manage a Facebook Business Page and have a credit card, you can take advantage of Facebook’s extensive targeting options and ad types to run effective Facebook ads for your business. You’ve likely seen the prompts from Facebook that tempt you with things like, “This post is performing better than 95% of your Page posts. Boost this post for $10 to reach up to 4,800 people.” You may have acted on those ad teasers. 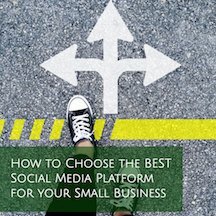 You might have clicked the blue Boost button on some of your published Page posts that you felt were important to get out in front of more people. You may have even tried your hand at building ads inside Ads Manager. If you’ve run some Facebook ads and either feel they didn’t perform the way you hoped or you want a trained eye to audit what you’ve done to make sure you are optimizing your campaigns, our Facebook Ads Account Audit Service is a great fit for you. 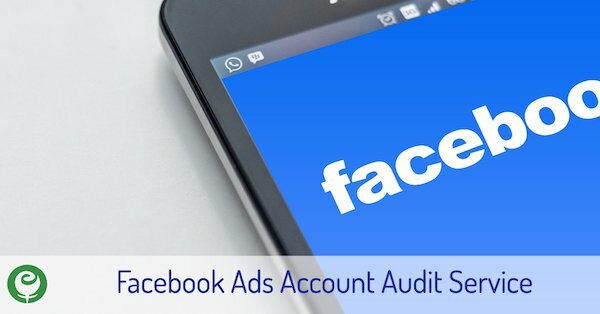 Who Needs an Audit of their Facebook Ads Account? Our Facebook Ads Account Audit Service is ideal for business owners who have run at least a few ads themselves and intend to continue running their own ad campaigns and boosts. Why Should I have my Facebook Ads Account Audited? We’ve offered Facebook ads training and ads management services for years, often times being added to a Facebook ads account after a business owner has been running his or her own ads. We have found, time and again, significant ways to improve our clients’ ads’ performance through a combination of auditing their existing targeting, ad types, ad copy, ad media and analyzing ad performance data. Better-performing ads means you move a lot closer to achieving the outcome for which you hoped with the ads while also getting more bang for your ad spend buck. What’s Included with my Facebook Ads Account Audit? If you would like your Facebook ads account audited, you will receive written feedback on what’s working well for you, what should be changed with your targeting, ad copy, ad objectives/types, and ad media, and how these elements should be changed. Understanding what parts of your Facebook ad campaigns are working well for you and what parts need some modifications to work better, is key for those small business owners managing their Facebook ads themselves. 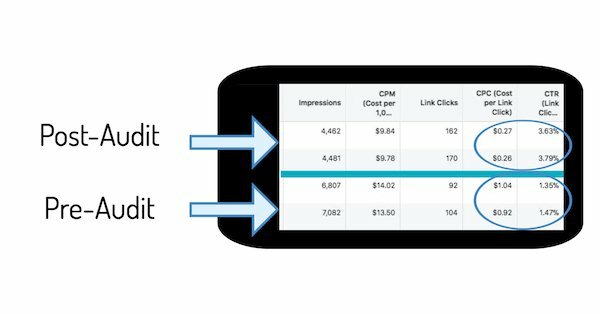 Here’s an example of the difference between pre-audit and post-audit click-through rates and cost per clicks with one client. This data was for the same ad, but with new targeting and a corrected ad objective/type. The pre-audit set of ads were costing $.92-1.04 per click and had click-through rates of 1.35-1.47%. The post-audit results were costing $.26-.27 per click and had click-through rates of 3.63-3.79%. If you have additional questions or are ready to get your Facebook ads account cleaned up, optimized, and working better for you, please fill out the form below and we’ll reply as soon as we can. If you prefer to call, our number is 901-496-3902. What type of Facebook Ads help are you interested in?